Компания Outotec входит в число крупнейших мировых поставщиков технологических разработок, производственных решений, оборудования и сервисных услуг для горнодобывающей отрасли. На онлайн-конференции мы расскажем о некоторых успешных проектах, реализованных в России и в мире, а также новых разработках Outotec, которые уже успешно используются на обогатительных фабриках в других странах мира, помогая нашим заказчикам создавать экологически эффективные предприятия. Introducing a series of webinars on tailings dewatering, the third webinar will introduce water recycling and treatment in mineral processing. Each webinar will cover the topic from equipment to plant, taking a holistic view of the issues that enable and constrain the technology. In water recycling and treatment, we review the basics of water in mineral processing, and then expand the concept to water recycling and treatment in mineral processing plants. Water recycling in mineral processing plant can significantly increase the amount of water available for processing. Recycling of water leads to increase in constituents present in water, leading to accumulation of impurities that can impact the recovery of metal within the flotation and reverse flotation processes. Review on testing of the impact of certain impurities has been carried out and results will be presented. At the end of the webinar we will outline recommendations for process water treatment that can improve the recovery. Introducing a series of webinars on tailings dewatering. The first webinar introduces thickening followed by tailings filtration and water treatment. Each webinar will cover the topic from equipment to plant, taking a holistic view of the issues that enable and constrain the technology. With tailings filtration and dry stacking, we briefly review the basics of solid-liquid separation from thickening and filtering, and then expand to dry material handling and dry stacking. It is essential to understand the material properties in order to optimize the compaction process, control the filling process, drain the tailings stack and plan its geometry, and control the stability of the tailings stack during its life cycle. Closing with a view from an operator’s perspective, including strategies for consistent performance and tips for avoiding process upsets. Introducing a series of webinars on tailings dewatering, the first webinar will introduce thickening followed by sessions on tailings filtration and water treatment. Each webinar will cover the topic from equipment to plant, taking a holistic view of the issues that enable and constrain the technology. With thickening, we review the basics of thickener operation and equipment selection, and then expand the concept to thickened tails transport and deposition. Controls and automation can significantly improve the performance of a thickener plant, keeping the outputs as close as possible to the design, maximizing water recovery and minimizing flocculant consumption. Closing with a view from an operator’s perspective, including strategies for consistent performance and tips for avoiding process upsets. Este webinar está enfocado en la importancia de los sistemas de muestreo en línea y su rol en los sistemas de análisis de muestras en las plantas de flotación. La instalación de las tuberías de manejo de muestras presentan características únicas que las diferencian de las tuberías convencionales de proceso (por ejemplo de agua de proceso o drenaje). La importancia de diseñar e instalar el sistema de muestreo es comúnmente descuidado, lo cual puede causar la pérdida de representatividad de las muestras obtenidas. Esto puede resultar en control de proceso inadecuado y terminar con una pérdida en la rentabilidad del proceso. El webinar cubrirá una discusión sobre cómo evitar estos problemas. This webinar will focus on the importance of a sampling system for an analyzer in a concentrator plant. Sample pipe routing and installation are more demanding than installation of process piping, e.g. water or sewer piping. The importance of designing and installing a sampling system is often overlooked causing a lack of representative samples. This results in poor process control and can decrease plant profitability. The webinar discusses how to overcome the above issues. Основной темой вебинара является концепция комплексного подхода Outotec к выбору шламовых насосов для перекачки пульп. По статистике, операционные затраты на работу насосов в среднем составляют 4-6% от расходов обогатительной фабрики, поэтому правильный выбор насосов и режимов их эксплуатации является важной составляющей оптимизации производства. Начиная с 2016 года, компания Outotec стала стратегическим партнером GIW Industries – одного из мировых лидеров по поставкам шламовых насосов. Объединяя обширные знания Outotec в технологиях обогащения и многолетний опыт GIW в области проектирования и изготовления шламовых насосов, мы готовы предоставить нашим заказчикам комплексные решения по перекачке пульп, обладающие высоким коэффициентом использования оборудования и оптимизированными операционными затратами, а также обеспечивающие стабильность технологических процессов и максимальную производительность. 4. Оптимизация систем перекачки пульп и модернизация насосов. El primer webinar de la serie introducirá la teoría básica del muestreo a nivel industrial, enfocado a la definición de conceptos básicos y los objetivos y requerimientos del mismo. Estos temas se discutirán a través de los conceptos para muestreo ideal, diseño del plan de muestreo, así como tamaño de muestra y número de repeticiones. Se cubrirán también estrategias de muestreo y los problemas típicos a considerar en el proceso de muestreo. Un mejor manejo de los conceptos básicos de muestreo le facilitará a nuestros participantes a mejorar su habilidad para diseñar los experimentos de planta necesarios para la mejoría de la rentabilidad de su proceso. The first webinar in the new series will introduce the theory of industrial sampling with a focus on basic definitions and the aims and needs for it. These will be discussed through the concepts of ideal sampling and sampling dimensions as well as the sample size and number of increments. The webinar will cover the topics of sampling strategies and the typical issues to consider in a sampling process. A better understanding of the theory will increase the participant’s ability to design meaningful experiments to improve the profitability of the plant. В настоящее время растет доля упорного золота. В России около 45% добываемых руд являются упорными. Как полагают эксперты, эта цифра будет только расти в будущем. В то же время в странах СНГ лишь несколько производителей золота обладают технологиями для переработки упорных руд и концентратов. Вследствие этого значительная часть упорного золотосодержащего концентрата экспортируется для переработки в Китай. Компания Оутотек является одним из мировых экспертов в технологиях извлечения золота из упорных руд. Кроме того, приобретение в июле 2015г. Южно-Африканской компании Biomin и ее технологий BIOX®, HiTeCC и ASTER существенно дополнило наше портфолио технологий. Outotec может предложить золотодобывающим предприятиям оптимальные технологические решения, учитывающие особенности каждого проекта, и поставить соответствующий комплекс оборудования собственного производства. В настоящее время растет доля упорного золота. В России около 45% добываемых золотосодержащих руд являются упорными. Как полагают эксперты, эта цифра будет только расти в будущем. This webinar will give you an overview of simulation history and terminology as well as explain use of simulation in personnel training and in ramp-up optimization. We will also introduce how simulators can be used for process control and what are the future opportunities in use of simulation. El tema a tratar será ‘Control y estrategia operativa del proceso de flotación’, en el cual Outotec demostrará la importancia de lograr el máximo control en una planta de flotación. Algunas de las herramientas básicas y avanzadas que han sido desarrolladas por Outotec serán presentadas a los participantes, así como los pasos para implementar una estrategia de control exitosa – enfatizando la diferencia entre estabilización y optimización de un circuito de flotación. Se invitará a los participantes a discutir los problemas actuales relacionados al control y estrategia operativa con el instructor. La duración de la presentación es de aproximadamente 45 minutos con 15 minutos para preguntas al final. The topic in focus will be ‘flotation control and operating philosophy,’ and Outotec will demonstrate the importance of having maximum control over a flotation plant. Some of the basic and advanced tools that have been developed will be introduced to participants, and how to build a successful control strategy will be discussed – highlighting the difference between the stabilization and optimization of a plant. Participants will be invited to discuss current issues in control and operating philosophy with the presenter. Duration of the presentation is approximately 45 minutes with 15 minutes Q&A at the end. El tema a tratar será el de ‘Modernizaciones y mejoras para plantas de flotación’, y la importancia que tienen las modernizaciones a plantas y equipos de flotación operando bajo las condiciones adversas de la industria de la minería en la actualidad. Con más de 100 años de desarrollo, Outotec ha logrado avances substanciales en tecnologías de flotación y control. Las nuevas tecnologías pueden ser utilizadas para reemplazar o mejorar los equipos existentes, logrando así mayores niveles de eficiencia, usabilidad, confiabilidad, estabilidad y flexibilidad. Los cambios en los cuerpos de mineral finalmente resultan en la necesidad de implementar cambios en los equipos existentes. Outotec explorará estos cambios y los últimos desarrollos en tecnología con los participantes, presentando herramientas simples que los asistentes podrán usar para identificar preliminarmente mejoras y sus beneficios. La duración de la presentación es de aproximadamente 45 minutos con 15 minutos para preguntas al final. The topic in focus will be ‘flotation modernizations and upgrades,’ and their vital importance in improving plants and processes operating under the current pressure of the mineral processing industry. With over 100 years of development, advances in flotation technology and controls have been substantial. New technology can be used to replace or improve existing equipment, leading to greater levels of efficiency, usability, reliability, stability and flexibility. 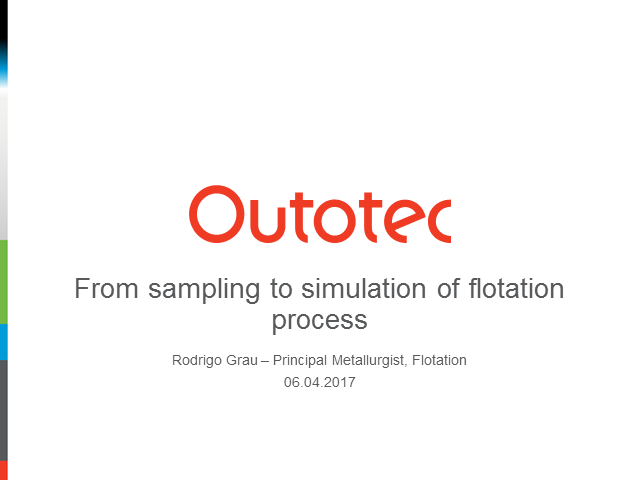 Changes in ore bodies mean that subsequent changes in equipment are also required – Outotec will explore these changes and latest developments with participants, introducing some simple tools that the audience can use to make preliminary assessments. Duration of the presentation is approximately 45 minutes with 15 minutes Q&A at the end. Estos problemas comunes de mantenimiento en conjunto con el desgaste de las piezas de refacción determinan en gran medida la eficiencia de una planta de flotación. Estos puntos serán discutidos con los participantes, así como una revisión general de algunas áreas críticas que afectan directamente al rendimiento de la planta. Un mantenimiento regular y bien definido puede prevenir paros inesperados, incrementar la disponibilidad y promover un mayor rendimiento en general de los componentes de la celda de flotación. La duración de la presentación es de aproximadamente 45 minutos con 15 minutos para preguntas al final. Outotec webinars for mining, metals and energy professionals. Outotec is hosting a series of educational webinars focusing on different minerals and metals processing topics. We help our customers create the smartest value from natural resources and work with them to find the most sustainable solutions for water, energy, minerals, and handling the full value chain from ore to metals.